The 14 year wait is over! So… what did we think of Incredibles 2 after all this time waiting for it? It’s complicated. In our lengthy discussion, we debate the merits and problems of the long-awaited Pixar sequel. We began with a Star Wars movie discussion and now we bring you another one just six months later. It’s almost like they released two Star Wars movies really close together. But that would be crazy! Our talk includes abbreviated thoughts on the first spin-off, Rogue One, and Star Wars expanded universes new and old. Oh, and we also talk about Solo, eventually. “Who won E3?” is a silly question that’s still kind of fun to ask. I love video games and over the years I’ve gotten into following the industry as a whole. E3 might be less important than it once was, but it’s still an event that functions as a barometer for the games business. Almost everybody is there or adjacent to the event. Watching E3 informs you about upcoming games, but read between the lines and you’ll also be informed about what’s going on with the organizations and people who make them. I heard one commentator refer to E3 2018 as a transitional year that everybody refused to acknowledge as a transitional year. I think that sums it up well. There were major games shown, but few major announcements. Sony and Microsoft seem like they’re in the thick of R&D on the next generation of consoles. Nintendo still seems to be rebounding from the stellar year they had last year. Because I am a huge nerd, I watched all the press conferences from the major players (no PC Gaming Show or Devolver Digital) and will now recap them in reverse order of how good I thought they were. EA’s event marks the unofficial start of E3. They have their own event in LA where their fans and “influencers” can come and see play their games. It’s indicative of the company’s attitude as a whole. EA seems content in their little corner of the games market these days. They’ve got a couple reliable moneymakers in FIFA, Madden, and Battlefield and own a host of old, beloved IPs that they’re willing to exploit as mobile games if they need some extra cash flow. EA is the most safe and businesslike of all the major game publishers. They’re dull. They don’t take a lot of risks. A few times a year they put out smaller, more intimate games from indie studios they’ve acquired or partnered with, but it really feels token at this point. This year’s conference was completely predictable and included all the regular staples of an EA show but with a dash more awkwardness, I think. There was a lot of talking to developers, but it all felt canned and insincere. BioWare’s Anthem was the most interesting part of the show. It looks like a Destiny/The Division style loot shooter with Iron Man suits and on paper that sounds fun. It looked fun too, but this is the sort of game that’s difficult to get an impression of in a stage demo – at least the kind that they’ve been giving. It’s been a few years since Square Enix even had an E3 show so this was something of a surprise. Unfortunately, the presentation itself was surprising due to its brevity and lack of content. Most of the games shown off were seen elsewhere or were already known quantities. Seeing Shadow of the Tomb Raider actually made me less interested in playing it. Just Cause 4 looks like another one of those games and has a lot to prove after the disappointment of Avalanche’s last couple outings. Admittedly, I’m not a fan of Square Enix’s Japanese franchises, but I think even those fans were left cold by the lack of significant announcements and especially the lack of news about the much-anticipated Final Fantasy VII remake which was announced years ago. Before the show we thought we’d get our first look at Crystal Dynamic’s Avengers game. Surely now would have been a great time to reveal that since Infinity War just made $2 billion globally. I guess it’s not ready, nor the Final Fantasy Remake which begs the question: why did they even bother to assemble a presentation? Oh well, at least Keith David got paid. For me, Nintendo’s presentation was the most personally disappointing. 2017 was a banner year for the company with the release of the Switch and amazing new entries in the Mario and Zelda franchises. Like a lot of fans, I was looking for Nintendo to paint a picture of the next year or two of Switch games. Instead we got a smattering of mostly previously announced games and then Smash, Smash, and more Smash. Super Smash Bros. Ultimate looks fine. It’s another Smash game, but I think Nintendo made a real mistake putting so much focus on one game. It worked better in previous years when focusing on Mario and Zelda. Those franchises have broad appeal. You could say Smash is broadly appealing as well – to a point. Despite featuring so many beloved characters, it’s still a fighting game and those are more niche than Mario and Zelda. Also, it was easier to forgive Nintendo for focusing on a single game in previous years because we knew they were revving up production on a bunch of new, exciting Switch games… right? This presentation leaves me wondering how true that’s been. Does Nintendo really not have much more to show or did they just colossally overestimate the amount of fans who would just be content with Smash Bros.? There was no Metroid Prime 4, no Mario Odyssey DLC, no Retro Studios project reveal, no Animal Crossing, no Pikmin 4, no old games remastered, and no additional info about the company’s forthcoming online service. Nintendo looked weak and that’s especially disheartening after last year. Ubisoft is a lot like EA except instead of being corporate and stodgy they’re oddball and awkward. Ubisoft tries so very hard to make their conferences fun, but I think they’ve been in a rut for a while in terms of actual games. The main reason I compare EA and Ubisoft is that Ubi often feels stuck in a box creatively. There’s some unique stuff being produced on the periphery, but their bread and butter is open world games with different coats of paint. Do you want to shoot terrorists in an open world? There’s a Tom Clancy game for you! Do you want to slit people’s throats in an open world? Assassin’s Creed. Do you want to race vehicles in an open world? The Crew 2. Do you want to be a pirate in an open world? Skull & Bones. That assessment is a bit reductive, obviously, but I feel like “do X thing in an open world” isn’t a compelling pitch by itself anymore. It hasn’t been for a while. There’s nothing really wrong with what Ubisoft showed this year, but it was all so underwhelming. The regularly recurring series’ looked fine (except for The Division 2’s shockingly tone-deaf premise), but the more experimental games were presented too vaguely to really get excited about. But Miyamoto showed up briefly and that was great. Nintendo didn’t even feature him this year! Why? As I’ve been writing this and reflecting on the show, I realize that only three of the conferences actually made me excited about the video games they presented this year. Only three of them were “good” in my eyes. Congrats, Sony. You made it. Barely. Sony’s conference was odd from a presentational standpoint. It started off in a venue that looked like church or wedding tent complete with string lights. When the first trailer began we saw that they’d recreated a location from it. The rest of the presentations took place in a different location after a disruptive break in the action. Novel, but very, very odd. Sony didn’t show many games, but the ones they did feature got a lot of room to breathe. Most of them featured extended gameplay segments and a little bit of story and character interaction. After so many action-packed trailers that were all style and very little substance, this was a breath of fresh air. It’s a far better way to show video games than imitating movie trailers or traditional ads. Ghost of Tsushima and Spider-man were the standout games for me. The former was jaw-droppingly gorgeous technically and artistically and the latter looks like it’ll be a ton of fun when it releases later this year. We saw more of Hideo Kojima’s Death Stranding looking weird and inscrutable as ever. Weird and inscrutable is all that game has going for it right now, unfortunately, because there’s been little-to-no clear indication of what the gameplay or story actually is or even when can expect the release. I remain opposed to The Last of Us Part II on principle. The first game is one of my all-time favorites. The ending was perfect in such a way that continuing a story with those characters will only damage its mystique and ambiguity. Some would say Naughty Dog has earned the benefit of the doubt and that’s probably true, but I’d like to be given an idea of what story would be worth telling to risk spoiling the ending of the first game. I resonate with more Bethesda-published games than those of any other publisher. The only stuff I don’t have any interest in are their mobile games and their MMO so Bethesda’s show was my personal favorite. Bethesda is the only major publisher that’s currently championing the good, old-fashioned immersive sim (Prey) and the good, old-fashioned linear first person shooter campaign (Wolfenstein, Doom). I happen to really enjoy these types of games along with Bethesda Game Studio’s Fallout and Elder Scrolls series. I even tried Quake Champions recently having never played a Quake game before and really enjoyed my time with it. If you were a Bethesda fan, you got serviced at this conference. New Prey DLC came out that night (and it’s excellent), a new Wolfenstein was announced, Quake Champions opened up to a wider audience, and of course Fallout 76 was detailed in-depth. Even Rage is getting a sequel. It’s a game that nobody asked for, but I appreciate that Bethesda is willing to give a disappointing IP another shot rather than letting it die completely. But absolutely my favorite moment of the show was the announcement of Doom Eternal, a sequel to Doom 2016, my favorite game of that year. It’s not entirely unexpected, but it was by no means a sure thing and I’m super hyped that we’ll be getting more from the same team that brough Doom back from the dead. Microsoft has been as boneheaded and corporate in years past as EA still is. They’ve been reeling and recovering from their disastrous Xbox One reveal for the entire length of this console generation. But under the leadership of Phil Spencer, the company’s gaming division has changed its stripes. Xbox has presented a decidedly more consumer-friendly front in recent years with moves like Xbox 360 backwards compatibility on Xbox One and bringing most of its exclusive games to a wider audience on Windows. The company seems focused on restoring trust and goodwill with the gaming community. This year’s presentation seemed to have the most games and most reveals of any conference and ultimately that’s what E3 is about. It was a show of strength and confidence as game after game was shown. The lineup was diverse and included a healthy amount of indie and triple-A games from studios around the world. There were even several Japanese titles revealed like the new From Software game, Sekiro: Shadows Die Twice, and the stylish Devil May Cry 5 from Capcom. That’s surprising given Microsoft’s spotty history of support from Japanese developers and consumers. The expected Xbox mainstays looked healthy and exciting even long-running series like Halo, Gears of War, and Forza Horizon. I’ve never played any of those series in earnest, but now I’m interested in the direction all of them are taking. Other highlights included a look at Metro Exodus (which has sadly been delayed to 2019), our first look at Shadow of the Tomb Raider (which showed up at a couple other conferences later on), and the surprise of Dying Light 2. It concluded with a showstopper: the trailer for Cyberpunk 2077 which, according to industry insiders who actually got to see the behind-closed-doors gameplay demo, was easily the game of the show. As I’ve written this, I’ve cooled on E3 2018. It wasn’t a downright weak year, but it was a hesitant one – one that smacked of uncertainty and caution from top companies in the industry. We’re probably 2 or 3 years out from a new generation of consoles and that means we’re getting close to seeing the last big games made for this generation. While future prospects are exciting, they aren’t in view yet and what we have right now is a bit deflating after 2016 and 2017 gave us so many amazing games. We’ve still got quite a year ahead for video games. Battlefield V, Spider-man, Super Smash Bros. Ultimate, Hitman 2, Shadow of the Tomb Raider, Fallout 76, Assassin’s Creed Odyssey, and Forza Horizon 4 all drop this year along with the highly anticipated Red Dead Redemption 2. 2018 has been a slow year so far, but the second half could really turn things around. Sometimes we talk about TV instead of movies. Well, this is the first time we’ve done that, actually. Broadchurch is a British crime drama series set in a small town in England. After a local boy is killed, a murder investigation tears apart the titular hamlet of Broadchurch. We cover Series 1 of 3 on this episode of the podcast. The first half of the episode gives our glowing general impressions while the second half descends into spoiler territory. It’s a really, really strong series and it’s well worth watching so we highly recommend not listening to the second half of the podcast if you haven’t watched the entirety of Series 1. We’ve seen Incredibles 2 and that should be our next episode. As we promised we’re taking a little break from heavy topics to talk about something a lighter and fun. On this episode we discuss sequels that should never have been made and/or ruined their respective franchises. And, in a follow-up discussion that is in no way connected to that, we give our impressions of Solo, the new Star Wars movie that everybody loves and couldn’t wait to see. After a long absence, scheduling difficulties, and some technical glitches, Bits Don’t Byte is back! We bring you another long, nerdy, in-depth discussion of a movie. If you’ve heard my movie podcast, then you know I was really jazzed about Infinity War. Find out what my co-hosts Joshua Kehe, his brother Ben think. We also discuss the MCU in general – the past and future including our favorites, least favorites, and theories for Avengers 4. Unfortunately with our remote podcast set up we had some technical issues. Please forgive the less-than-pristine audio quality. We’ll try and have that back up to snuff next time. Speaking of next time, we’d like to do these more often and have several topics we’re excited to talk about in-depth provided we can schedule it. So hopefully the next episode will be out than 6 months from now. On this anniversary of the Allied Invasion of Normandy, we actually spend a little time thinking about war and how neither of us would have probably survived *any* of them. The serious topics continue as we talk about when people leave the faith. We promise next episode will be less sobering. 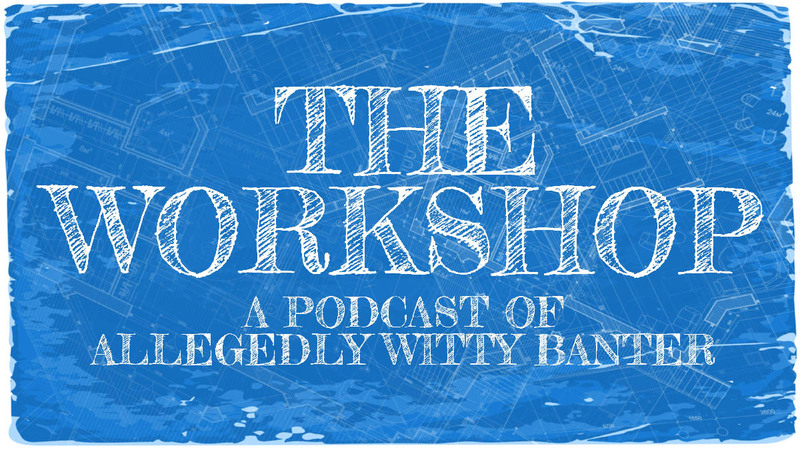 On The Workshop podcast Eric and Matt take on the world with a healthy supply of wit and not much else.